Newport and Gwent have generally been well served by local historians. Amongst this diligent activity Cliff Knight’s work stands out because the recollections of a man who has lived through almost all the last century are bound to have an especial timbre. Cliff Knight was known for his accurate memories of Newport, where he was brought up ‘in the shadow of the Transporter’. On leaving school he was employed on the Transporter selling tickets to the workmen crossing the bridge. After the Second World War he worked for the council’s planning department. ‘I learned a lot more about Newport during that time’, he said. 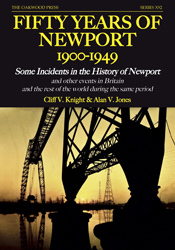 Cliff retired in 1982 and was encouraged to write accounts of Newport’s local history. He was also a frequent contributor to the South Wales Argus on historical matters. Contact with the internet etc. has been the task of the other writer, Alan Jones, who has acted as the ‘legs’ for some of the work. The suggestion that Alan made of putting the years in a more global context led to more bookwork and research. This book takes us on a chronological journey through the first half of the 20th century with supporting photographs, and it complements Cliff Knight’s, now out of print and much sought after, previous publications. To help put the local history into a wider context it was decided to put the British and world scene at the start of each year to show up Newport in the light of world events. Emphasis, however, has been on the photographs and events of Newport. A5 format, 160 pages, more than 200 illustrations.